This blog went on a nice relaxing sabbatical for a few months while its author worked her tail-end off, preparing and leading a study abroad program in Rome. The program concluded, I went up to Cambridge for a few days to cool off and relax. 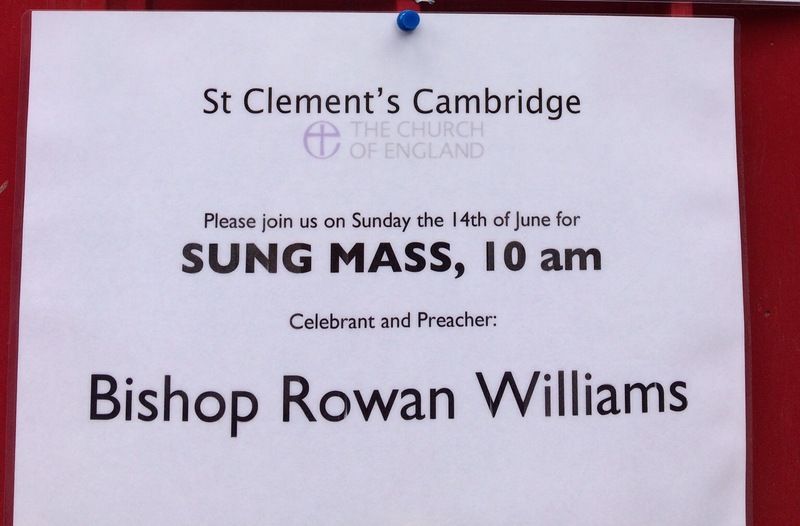 The day of my arrival, I noticed a sign announcing that Rowan Williams, former Archbishop of Canterbury and probably the person most frequently cited in my books (after God), would be speaking the following Sunday. Although in the midst of a bad back episode, I determined I would be there Sunday unless actually dead in a ditch. It happened to be Williams’ birthday, and after chatting briefly with him and moving on to the cake, I came home and wrote the following. Susan Pitchford, on shaking hands with Bishop Williams after Mass: Happy birthday. I hope the Big Job didn’t take too many years off your life. Rowan Williams: Well, I’m not sure I’ve thought of it that way before. SP: Rather a morbid thought for one’s birthday, I suppose. SP: That’s the thing about being a rock star: one day they’re throwing their underwear at you, the next day it’s vegetables. RW: Erm. I don’t think I can recall having underwear thrown at me. SP: Well, we all did it in spirit. Which takes me back to the last conversation I had with someone famous and important. I was in the VIP line in the back room at a Democratic Party fundraiser, where a few people with lofty connections were being introduced to President Obama. In my case, the lofty connection was my stepdaughter, who worked for the President for eight years. In front of me in line was her mother. Staffer making introductions: And this is Danielle’s mother. Staffer: Aaaand…this is her stepmother. SP: I just locked her in the basement. I have now told the President of the United States that I locked my stepdaughter in the basement, and have told the former Archbishop of Canterbury that I threw my underwear at him in spirit. I have to wonder: What impulse is it that drives me to tell important men that I’m an idiot? There’s another important guy whom I haven’t met personally, but whom a large crowd of people “met” recently not far from here. The headlines tell me it was young Prince George’s first time on The Balcony at Buckingham Palace, from which the Royal Family traditionally wave to the proles below. You have to be very special indeed to land on the royal perch: if not royal yourself, I think you have to actually be Archbishop of Canterbury, or Winston Churchill or something. That’s how things are done in this world. The people who matter are up on the balcony, and the rest of us gaze up from below, in admiration or possibly envy, resentment, even murderous revolutionary intent. (Not speaking for myself, you understand.) If the people who matter do mingle with the rest of us, they are doled out in small doses, like scheduled drugs, so that there’s no opportunity to have a meaningful conversation. It’s not their fault, of course. Some of them are undoubtedly elitists who don’t want to mingle with the little people. Some of them are probably introverts who hate making small talk and would love to just sit down and chat one-on-one. It doesn’t really matter, though, because regardless of their preferences there’s never enough of them to go around. So we small ones gaze up from below, or shake hands and say something absurd, and then we leave the absurd situation and go our separate ways. And this is why I’m a Christian. According to the gospel, as both Barack Obama and Rowan Williams could certainly tell you, there is no balcony, no gulf separating the people who matter from the people who don’t. Everything is inverted in the upside-down kingdom of God. Or perhaps I should say that there is a balcony, but it’s huge, and we’re all invited up. I sat through the service today knowing I wouldn’t have a chance to tell Bishop Williams how much his work has meant to me, because I’m just an insignificant American visitor. But then I remembered that every single one of us was, in the Eucharist, being invited to the most intimate encounter possible with the One who matters more than anything, the One whose presence will shut the mouths of kings, as Isaiah says (52:15). I’m a Christian, not because I find this thought comforting, but because I think it’s true. Lots of people don’t; they figure nice dreams like that are a good way to keep us little people from taking over the balcony by force. Karl Marx famously said that religion is the opiate of the people. My colleague Rodney Stark counters that religion has often been the amphetamine of the people. (Consider the Civil Rights movement as Exhibit A.) In my experience, the gospel dishes out comfort and discomfort in about equal measure, so there’s no point in embracing it unless it’s true. I think it is true, and I might be wrong. But if so, the ideal of a world in which every person is equally significant is still worth fighting for. As Puddleglum says in C.S. Lewis’s book The Silver Chair, “I’m on Aslan’s side even if there isn’t any Aslan to lead it. I’m going to live as like a Narnian as I can even if there isn’t any Narnia.” I’m going to fight like hell for that upside-down kingdom, and when it is fully realized, then I’ll see Barack Obama and Rowan Williams on the balcony. And maybe I’ll have a chance to convince them that I’m not half as crazy as I sounded last time we met.